Funds from a dollar bank account in the name of the Jammeh Foundation for Peace, a charity founded by Gambia’s former president Yahya Jammeh, flowed to Jammeh himself, not to foundation projects, according to bank records and interviews with a former charity official and a former presidential staff member. In 2012 and 2013, over $8 million was paid into the account at Gambia’s Trust Bank. Over half of the money was withdrawn in cash, Reuters has found. Reuters was unable to determine whether donors intended to support the charity, or if donors, charity officials and the bank were aware that Jammeh was using the account to build his personal wealth. Reuters could not determine how the withdrawn money was spent. 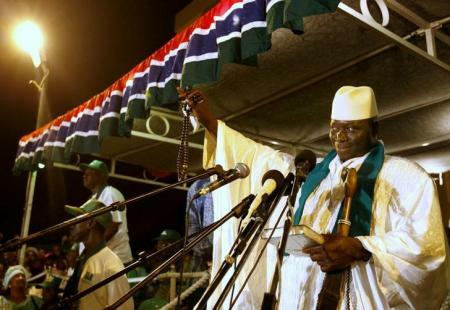 Gambia’s new government has accused the former president of plundering many millions of dollars during his 22-year rule. On Monday, Finance Minister Amadou Sanneh said Jammeh had committed fraud on a massive scale including siphoning off tens of millions of dollars in public money into various bank accounts not in his name but from which he withdrew cash, including at the central bank. The Jammeh Foundation for Peace’s former deputy CEO, Modou Lamin Manga, told Reuters that the charity did not at the time receive donations via the dollar account, which was one of two accounts held in the foundation’s name at Trust Bank during Manga’s tenure from 2010 to 2015. Manga was let go from the foundation during layoffs in 2015. The Jammeh Foundation for Peace did not respond to multiple requests for comment. An official at Gambia’s Trust Bank Ltd, who declined to be named, confirmed the foundation banked there but declined to give further details. Attempts to contact Jammeh in Equatorial Guinea, where he fled into exile last month after an election defeat, were unsuccessful. Edward Gomez, Jammeh’s lawyer until last month, said he was unaware of any misspending by Jammeh. “I know that many people have benefited from the foundation but I can’t say where the money came from and who had access to it,” Gomez said. The bank statements reviewed by Reuters showed that over $8 million was deposited in 11 instalments into the U.S. dollar account in the foundation’s name at Trust Bank in 2012 and 2013. All of the money was withdrawn. There were 15 cash withdrawals in 2012 and 2013, ranging from $75,000 to over $500,000: $4.3 million in total. A further $1.5 million was transferred to overseas accounts, the statements show. The remainder was drawn down in letters of credit, miscellaneous withdrawals and interest charges. Some cash withdrawals give direct reference to Jammeh, who at the time was the foundation’s chief patron, meaning he lent his name in support of its work. Manga said Jammeh played only an occasional role in the foundation’s activities. These include education, health and agricultural projects, according to its website. In March 2013, a $75,930 withdrawal was detailed as: “CASH WDL B/O DR YAHYA AJJ JAMMEH”. A Trust Bank worker interviewed by Reuters said that B/O stood for “by order of” and WDL stood for “withdrawal”. Reuters was unable to determine the source of most of the money in the account. Euro African held exclusive rights to import fuel to Gambia between 2008 and 2013 and a fuel supply deal to the state-run utility. Euro African head Mohamed Bazzi told Reuters the company made three payments to the foundation totalling $1.3 million in 2013. Bazzi did not specify which account the money was paid into. Reuters was unable to account for the difference between this total and that reflected on the bank statements. Bazzi was unable to explain the difference. Bazzi, a prominent Lebanese businessman who has done business in Gambia for over a decade, told Reuters the money went towards a mosque, a hospital and bringing in foreign doctors to Gambia. Bazzi said Euro African made the payments on behalf of a telecommunications company that he declined to name. The telecommunications company was a separate entity and the money was not Euro African’s money, he said. The statements also show a $99,982.50 payment was made on April 17, 2013 by Selectra AG, a Swiss-based engineering firm. Selectra did not respond to requests for comment. The foundation’s former deputy CEO Manga said he first became aware of the account and the deposits when Trust Bank accidentally sent him statements for the dollar account in 2013. He said he thought the money could be used to fund scholarships and a hospital. Unlike the Trust Bank account that the charity used for everyday expenses, this one held dollars, not dalasis, the local currency, and had far more money. When Manga approached officials at Trust Bank Ltd about the account in 2013, they told him not to touch the money, he said. The account manager told him it was “Yahya’s” (Jammeh’s) account, Manga said. “We were struggling to run communities and we had all this money in this account. Why couldn’t we make use of it?” said Manga. A former member of Jammeh’s staff, who spoke on condition of anonymity, said he frequently collected money from the foundation dollar account at the president’s request and returned to State House with bags filled with cash in bundles of $10,000, wrapped in a paper band carrying the Trust Bank seal. “Whenever Jammeh needed money, he would go to that (foundation) account and withdraw money. If his wife went travelling, they would take money out,” he said. Reuters was unable to reach Jammeh’s wife, who until last month was the foundation’s president and closely involved in the running of the charity, according to the website. Another source who worked as a personal assistant for Jammeh from 2009-2012 and who was fired and jailed for espionage, charges he denies, said he withdrew hundreds of thousands of dollars in cash in 2011 and 2012 from another account called the National Security Account at Trust Bank, on Jammeh’s behalf. Other times, he said he wired money from that account to Jammeh’s wife’s personal account in the United States. Trust Bank declined to comment on the National Security Account and who had access to it. Jammeh’s spending hinted at his riches. He had a fleet of black Rolls Royce limousines whose headrests carry his name embroidered in dark thread, and a house in Maryland, according to a Reuters witness and a U.S. official. On a trip to New York for a U.N. summit in 2002, Jammeh had $1 million in cash in cellophane wrapping brought to his hotel room, his former lobbyist John Aycoth told Reuters. He bought expensive watches and tipped a dental hygienist $20,000, said Aycoth, who successfully sued the Gambian government in a U.S. court for failure to compensate his firm in 2006. Reuters could not independently confirm these accounts. “I know he had great wealth. I have no doubt about that,” said Jammeh’s former lawyer Gomez. Gambia’s new leaders said Jammeh took a fleet of luxury cars with him into exile. Now, in the aftermath of his rule, many Gambians demand his wealth be returned immediately. The country’s economy is in tatters with only three weeks left of import funds. “The president and his government will take all steps and measures to ensure that all the lost, stolen and misappropriated assets are returned to the Gambian people,” Gambian Finance Minister Sanneh told reporters on Monday. Who is South Africa’s New Public Protector and What’s on Her Plate?